A bare body shell is 300 to 350 lbs. I use a standard freight pallet a hefty castor in each corner to make my dollies. Add a piece of old carpet if you want and - hey presto. Car engines make CO2 and trees absorb CO2. By running your engine you're feeding a tree and helping the environment. 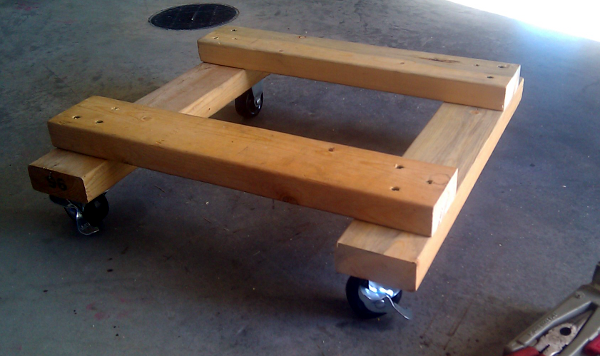 My body roller consist of some angle iron we had laying around welded into a triangle, threw on some legs and casters. I put the shell on the roller myself, so can't be that heavy. Not sure. I'm guessing ~ 300 lbs. I will be weighing it with competition scales in the next week (without roller) but that will include the weight of the new roll cage. I'll post when I've weighed it. Thanks Jeff! That is what I needed. 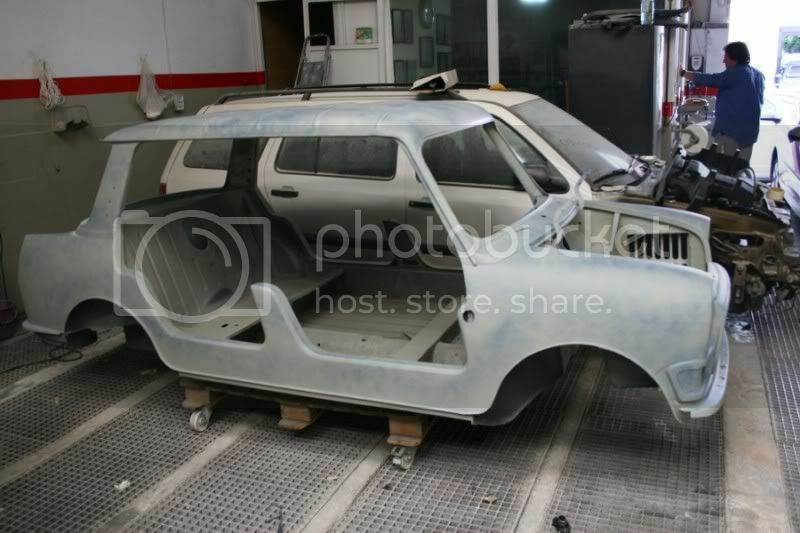 Any idea what the weight is of just the bodyshell, no glass? I just did this since I'm doing work on a NOS shell. Place a 2x4 under the body at the front edge of the shell so that about 6" sticks out on each side. Do the same at the rear. Run a 2x4 along the sills under the perpendicular 2x4s. Mount some Harbour Freight casters at each corner with big carriage bolts to hold each corner together. Since my NOS shell is an SPI shell it has captured nuts in the sills at the four corners which made it a breeze to solid mount to the roller. For me the car ended up sitting at almost the same height as with the suspension mounted so it worked out really well. If you use swivel casters at each corner you can easily push the shell around. I delivered my shell to my roll cage fabricator via my trailer without issue. I can post pics if you want. I had some extra 1" angle iron kicking around the garage... cut it into 3'-4' sections, welded them into a square, mounted some casters from harbor freight, and put some scrap 2x4's into the square.. it;s cheap, light, and it works.. Thanks guys for the recs. Looking at all this now. I have gone the 2 x 4 route. The Mini floor sits on top of the cart. There is a split running down the middle for gas line, batery cable etc. to avoid pinching. I own one of Nick's carts. I roll the cars up and down my hill regularly moving from one garage to another. It also can be dis-assembled for storage. I use custom made body carts. easy to move by yourself and a perfect height for working on during body work. Simple 2x4 frame with gussets in the corners with caster wheels works fine. Has anyone build a really basic bare body shell roller during a resto? Looking at something like this, but looking for advice on build or dimensions. Need something that can be moved easily and built easily and one that will not damage any of the floor pans (or will it be light enough not to worry about this).